The seventh Diary of a Wimpy Kid book will be launched simultaneously in seven countries, the first-ever global launch for a Wimpy Kid title. 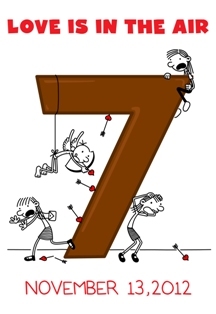 Publishers in the U.K., Australia, Germany, Greece, Japan, Korea and Norway will release Diary of a Wimpy Kid #7 in their respective territories the day after Amulet Books releases the book in the U.S. on Tuesday, November 13. Yesterday at the Bologna Children's Book Fair, Wimpy Kid creator Jeff Kinney said, "Never in my wildest dreams did I think that Greg Heffley's stories would be enjoyed by kids around the world." The Diary of a Wimpy Kid series has hit bestseller lists in Germany, the U.K., Australia, Norway, Israel, the Netherlands and Italy, and The Diary of a Wimpy Kid most recently won the Blue Peter award in the U.K. for the best children's book of the last decade. The movie's soundtrack, which was released at midnight Tuesday, now tops the album bestseller lists at both iTunes and Amazon. CNN Money reported that while young adults love The Hunger Games, "the biggest fans may be from an older generation--investors." Shares of Lions Gate Entertainment, parent company of Lionsgate studio, "are up 75% so far this year after a gaining more than 7% Tuesday to close at a record high of $15.27, and they were up another 4% in early trading Wednesday." CNN Money also noted that "shares of Scholastic are up 22.5% year to date after a 1.7% rise in trading Tuesday, and were up another 1.8% Wednesday." Fans began lining up Monday for a "strictly-enforced" booksigning Tuesday night at the Barnes & Noble store in Manhattan's Union Square, the New York Times reported, noting that hundreds of people endured "a long, anxiety-filled wait... in the hope of getting a glimpse of someone, anyone, associated with the film." Meanwhile, in another part of the city, a "secret" screening at a Chelsea theater drew "an unexpected crowd of admirers," the Daily News reported. "Held at bay by barricades and private security, fans cheered wildly as stars of the film pulled up in black cars.... Organizers of the screening, hosted by the Cinema Society and the Calvin Klein Collection, pleaded with media outlets to keep the event secret to avoid gawkers." The story was essentially the same elsewhere in the U.S. as the magic hour drew near. For example, by yesterday morning, nearly half of the 30 midnight screenings in Omaha, Neb., were sold out, according to the World-Herald, which noted that the situation "was likely to change" to completely sold out by today. Fashion conscious fans have also taken notice. 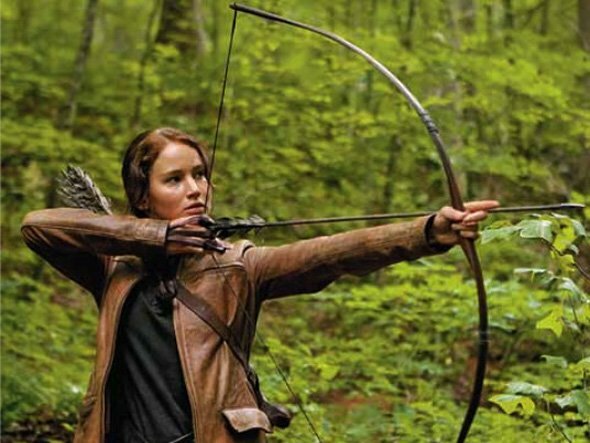 CNN reported that "dozens of 'how-to-dress like Katniss' Web pages, blog posts and articles are being bookmarked and pinned up by girls of all ages. But when did hunting gear and cotton dresses become so fashionable?" "Katniss has practical clothes--it has to make sense where she got them. District 12 is American work wear, and that is what she would wear while she hunted," said the film's costume designer Judianna Makovsky, adding that she "didn't want the fashion to take over, (because) that is not what the movie is about. The movie is about a girl's journey. That is what a costume designer does, we tell the character's story." 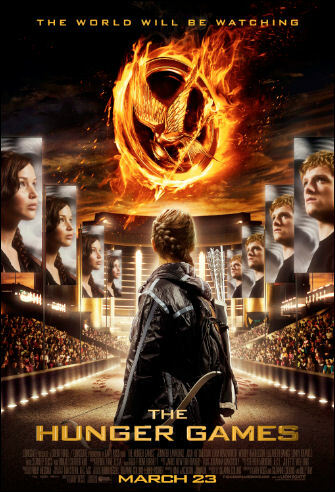 North Carolina film officials hope that serving as the location for filming of The Hunger Games will help the state "re-emerge as one of the top shooting destinations outside of California." The Los Angeles Times reported that Lionsgate spent an estimated $60 million in the state, employing 180 crew members and more than 4,000 extras. #potlit: New St. Martin's Genre? This week is feeling like April Fools two weeks early. Except that all the stories are true. First, Amazon buys a robot company to replace many workers in its warehouses. Then a Barnes & Noble executive says that the company refers to the aggregate Nook tablet customer as "Julie." Now, as reported by the Smoking Gun, federal agents intercept two packages of marijuana bound for "Karen Wright," apparently a fictitious person, at St. Martin's Press offices in New York. Sent from San Diego, the 11 lbs. of weed have a street value of $70,000. By late afternoon, #potlit had become a trending topic. And by the end of the day, at least two new Twitter accounts, @KarenWrightNYC and @KarenWright_SMP, had joined in. MobyLives helpfully provided a slideshow of 10 Marijuana-Loving Authors. 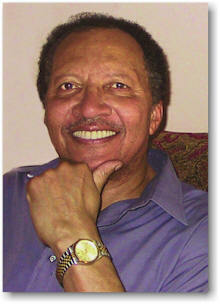 Author and National Ambassador for Young People's Literature Walter Dean Myers will serve as the honorary chair of annual children's art auction at BookExpo America that is sponsored by the ABC Children's Group at the American Booksellers Association. Proceeds of the auction and reception will help support the American Booksellers Foundation for Free Expression and its Kids' Right to Read Project, which opposes the hundreds of challenges to books that occur in schools and libraries every year. "Over the years, I've seen censorship grow," Myers said. "The bottom line is that the America we love needs our support. We have to stand up and be counted." Myers's son, Christopher, who has illustrated many of his father's books, will also act as auctioneer during a live segment of the otherwise silent auction. The ABC auction will be held on June 6 from 5 to 8 p.m. in the South Concourse of the Javits Center. Tickets for the auction and reception are $95 ($75 for bookseller members of the ABC Children's Group) and can be purchased here. If tickets don't sell out beforehand, they can be purchased at the event for $105 ($85 for ABC Children's Group members). Gottwals Books, which operates four used bookstores in Georgia, is exploring the possibility of selling franchises nationally. 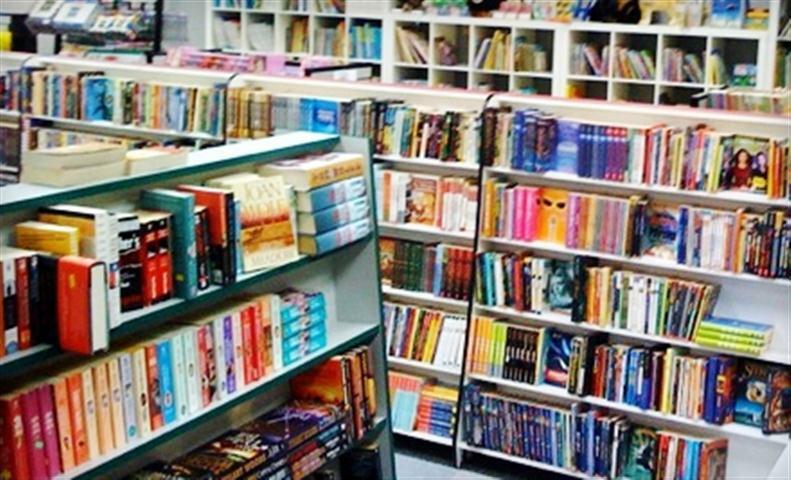 According to 13WMAZ, the Gottwal family has "hired a California-based firm to complete the franchising process.... Clients who franchise Gottwals Books will be able to purchase full rights to their own bookstores with full consultation trademark rights and training." Gottwals opened its Warner Robins store in 2007, and has since added shops in Byron, Macon and Perry. 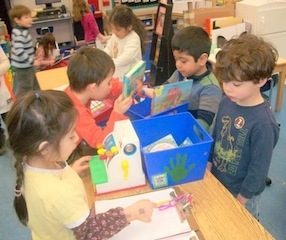 Recently Francine Lucidon, owner of the nearly five-year-old Voracious Reader in Larchmont, N.Y., hosted Mamaroneck Avenue School's Pre-K Class from nearby Mamaroneck. The class wanted to learn how an independent bookstore is created and runs--and had questions about everything from how to select books to managing an in-store cafe. Back in the classroom, they created their own independent bookstore, I Spy, A Bookstore, and held a grand opening. Pictured are happy book buyers, supporting their new local indie. 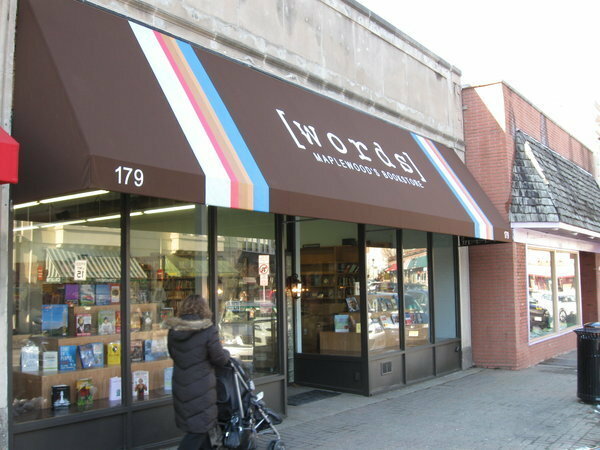 "Over the past year, Words in Maplewood has held approximately 100 author events, hosting the likes of Garrison Keillor, Ed Koch and Dionne Warwick. A new website allows customers to order books and e-books online. In 2011, Words was honored with the national Disability Matters Award and featured in Entrepreneur magazine for its program to employ individuals with autism." Runners up were Montclair Book Center, Montclair, and Paranormal Books and Curiosities, Asbury Park. Last week San Francisco's Beat Museum hosted a celebration on what would have been Jack Kerouac's 90th birthday. Beat and neo-Beat poets read Kerouac-inspired work and a scroll--in the tradition of Kerouac's On the Road--was passed through the audience for their reminiscences and inspirations. At end of the event, Viva Editions associate publisher Brenda Knight (center) and poet Nick Belardes (right) presented the scroll to Beat Museum proprietor Jerry Cimino (left). "Samuel Beckett, what a man. You'd never guess that something like this would be popular in the hills of Thailand," said George O'Brien, pulling a copy of Waiting for Godot from a shelf at his Back Street Book Shop in Chiang Mai. 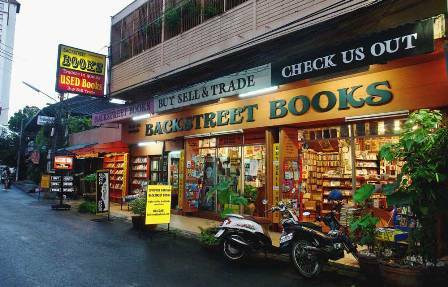 The Bangkok Post profiled O'Brien and his shop, one of the city's many used bookstores that are "veritable Aladdin's caves for bibliophiles who can spend days happily browsing through every nook and cranny in search of that rare and elusive bargain." O'Brien's customers come from all over the world and are joined "by the over 30,000 American expatriate retirees who have voted Chiang Mai the second most popular retirement destination in the world," the Bangkok Post wrote. Bloom: Finding Beauty in the Unexpected by Kelle Hampton (Morrow), which grew out of the author's blog, Enjoying the Small Things, about her journey as the mother of a baby with Down's Syndrome. This morning on Imus in the Morning: Kevin Smith, author of Tough Sh*t: Life Advice from a Fat, Lazy Slob Who Did Good (Gotham, $25, 9781592406890). Today on MSNBC's Dylan Ratigan Show: Eric Klinenberg, author of Going Solo: The Extraordinary Rise and Surprising Appeal of Living Alone (Penguin, $27.95, 9781594203220). Tomorrow on NPR's Science Friday: Jon Gertner, author of The Idea Factory: Bell Labs and the Great Age of American Innovation (Penguin, $29.95, 9781594203282). Tomorrow on NPR's Diane Rehm Show: David Corn, author of Showdown: The Inside Story of How Obama Fought Back Against Boehner, Cantor, and the Tea Party (Morrow, $26.99, 9780062107992). Also on Diane Rehm: Ahmed Rashid, author of Pakistan on the Brink: The Future of America, Pakistan, and Afghanistan (Viking, $26.95, 9780670023462). Tomorrow night on Late Night with Jimmy Fallon: Bethenny Frankel, author of A Place of Yes: 10 Rules for Getting Everything You Want Out of Life (Touchstone, $16, 9781439186916). Book TV airs on C-Span 2 this week from 8 a.m. Saturday to 8 a.m. Monday and focuses on political and historical books as well as the book industry. The following are highlights for this coming weekend. For more information, go to Book TV's website. 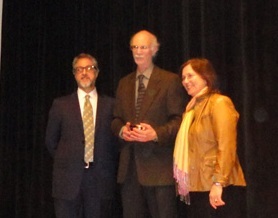 Millhauser (center) poses with Larry Dark and Story Prize founder Julie Lindsey after the ceremony. Steven Millhauser has won the eighth annual Story Prize for We Others: New and Selected Stories, a collection he had been reluctant to put together when his editor, Knopf's Robin Desser, first suggested it. "I feared that such a book would only be a tombstone," he confessed while accepting the award at a ceremony at Manhattan's New School. Earlier in the evening, during a series of readings with fellow nominees Don DeLillo and Edith Pearlman and interviews with Story Prize director Larry Dark, Millhauser discussed how he chose the stories from previous collections that made it into this book. "I tried to pretend I was reading stories I didn't know," he said. "And if something surprised me, I chose it." Over a cup of coffee in a diner, impassioned publisher and thankful husband Rudy Shur convinced Dr. Raymond Chang he shouldn't wait until retirement to write Beyond the Magic Bullet: The Anti-Cancer Cocktail (Shelf Awareness, January 31, 2012). Of the myriad health titles that Shur, the founder of Square One Publishers, has worked on over the years, none was inspired by as compelling and personal of a reason as this one. In 2007, Shur's wife, Erica, was diagnosed with anaplastic thyroid cancer (ATC). The rare, aggressive cancer has an extremely high mortality rate and usually claims a patient's life within several months. Conventional treatments are largely ineffectual, as surgery cannot cure ATC and radiation and chemotherapy offer minimal benefits. Even the many oncologists the family consulted encouraged them to try another approach. "They told us they didn't have anything for us, which is depressing, but they were being honest," recalled Shur. On the day Erica underwent surgery, Shur read a Wall Street Journal article profiling several people who had successfully beat the odds against terminal cancer using the "cocktail" strategy. The anti-cancer cocktail is a combination of nutritional supplements and off-label drugs, such as antibiotics, antidepressants and statins, which have shown some kind of effectiveness against cancer. A similar approach was used successfully to fight AIDS in the 1990s. When Shur started asking around for a qualified doctor to work with on the alternative method, Dr. Chang's name came up more than once. Currently on the faculty of the Weill Cornell Medical College and in private practice in New York City, Dr. Chang was educated at Brown University and previously worked at the Memorial Sloan-Kettering Cancer Center. A week after Erica finished radiation treatments, she began the cocktail therapy. The ATC came back twice and tumors were removed from her lungs, with each occurrence indicating significant improvement. For the last three and a half years, she has been cancer free. Erica's outcome inspired Shur to use the medium at his disposal to get the word out about the anti-cancer cocktail. "If this can help broaden the approaches being used against cancers that have no immediate cures/treatments, I thought it would be helpful to get a book out there and touch that many more lives," said Shur. "If there isn't any current magic bullet to fight a cancer, does it not make more sense to throw the kitchen sink at it as long as it doesn't hurt the patient?" In addition, he noted, the cocktail approach is a fraction of the cost of chemotherapy. In 1976, Shur co-founded the Avery Publishing Group, which developed a specialty in alternative health books. His interest in the topic began after a friend, who was in his late 20s, passed away from cancer after a two-year battle. In a series of operations, doctors removed the patient's jaw, cheekbone and parts of his skull in a futile effort to stave off the disease. Motivated to research the realm of alternative healthcare, "I started to understand there was more to health than just taking a vitamin," Shur said. "I certainly have nothing against conventional medicine, but when they don't have an answer, it's important to recognize that fact." Shur has continued the tradition of publishing alternative health titles at Square One and is on a mission to create awareness for Beyond the Magic Bullet and to make sure cancer patients and their caregivers know cocktail therapy is as option. "If we can do that, there's a good chance we can add to the arsenal of treatments we have not just against the deadly ones but all cancers," said Shur. "It would be an amazing thing to pop 10 pills a day and wind up wiping out a cancer." The foreword to Beyond the Magic Bullet was written by Ben Williams, a psychology professor at the University of California at San Diego and the author of Surviving 'Terminal' Cancer: Clinical Trials, Drug Cocktails, and Other Treatments Your Oncologist Won't Tell You About. After being diagnosed with a type of brain cancer considered a "death sentence," Williams treated himself using the cocktail approach. That was 16 years ago. When Dr. Chang informed his publisher he had lined up someone to write the foreword, Shur realized Williams had been featured in the Wall Street Journal article he read the day Erica went into surgery. Also profiled in the piece was a defense-contractor recruiter who, inspired by Williams's book, devised a cocktail for his seven-year-old son, who suffered from an often-fatal cancer of the nerves. The Unruly Passions of Eugenie R. by Carole DeSanti (Houghton Mifflin Harcourt, $26, 9780547553092) follows a young woman struggling to escape the brothels, poverty and social upheavals of 19th-century Paris. The author is longtime editor-at-large for Penguin. Drift: The Unmooring of American Military Power by Rachel Maddow (Crown, $25, 9780307460981) explores how the U.S. became a national security state waging perpetual war. The Big Miss: My Years Coaching Tiger Woods by Hank Haney (Crown Archetype, $26, 9780307985989) gives an insider account of the height of Woods' career and his scandalous downfall. Guilty Wives by James Patterson and David Ellis (Little, Brown, $27.99, 9780316097567) finds four best friends arrested for a mysterious crime after an overindulgent girls-only weekend. Lover Reborn by J. R. Ward (NAL, $27.95, 9780451235848) continues the vampire romance/fantasy Black Dagger Brotherhood series. Dead Reckoning: A Sookie Stackhouse Novel by Charlaine Harris (Ace, $7.99, 9781937007355). The Global Warming Reader: A Century of Writing About Climate Change by Bill McKibben (Penguin, $18, 9780143121893). The Widow's Daughter: A Novel by Nicholas Edlin (Penguin, $15, 9780143120827). Every Man for Himself by Beryl Bainbridge (Europa Editions, $16, 9781609450861). Over the course of a trilogy of novels, Robert Olmstead has chronicled a century of war and its aftermath in the lives of the men of the Childs family. In Coal Black Horse (2007), Robey Childs confronts the horrors of the Civil War in search of his father; then Napoleon Childs chases Pancho Villa through the mountains of Mexico in Far Bright Star (2009). 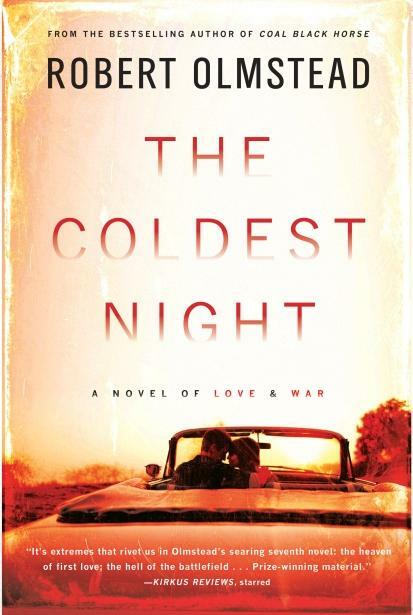 In the concluding volume, The Coldest Night, Olmstead brings us the even darker tale of Robey's grandson Henry, from a fatherless childhood through the bloody Battle of the Chosin Reservoir in the Korean War until, scarred inside and out, he finally returns to his West Virginia home town--where all that remain of the Childs family are his mother's grave and a surviving aunt. Henry seems doomed to his lineage: "The men in Henry's family, they were big, sprawling, raw boned. They were angular, muscular, warlike, and discontented." In the first part of the novel, the young Henry finds some comfort in horses, baseball and a romantic relationship with Mercy, the impetuous daughter of a wealthy judge. Although they elope to New Orleans full of hope and love, the judge sends Mercy's brother to bring her home and beat Henry senseless, a warning not to follow her back. He enlists in the Marine Corps, where he finds new purpose and a home: "They gave him three meals a day and a roof over his head, and he fired his rifle and screamed and bayoneted straw dummies. They told him he would be one of them forever." However, in the winter snow and cold of the Korean mountains well north of the 38th Parallel, Henry learns that no one is anything forever. His Marine family is slaughtered, the few survivors left "deep in the coma of war, walking back down that frozen road... icicles of blood hanging from their bodies." Shelf Talker: Olmstead's sharply realistic language describes the devastating impact of war on a heartbroken young man.